When it comes to blogging, one of the most common questions I receive as a freelance real estate writer is: "How long should my real estate blog be?". Well of course, the answer to that will depend on a variety of factors such as the topic and how in-depth the post should be to promote your business or product effectively. If you are hiring a professional writer like myself, to produce the content of your real estate blog for you, budget will likely be another factor to consider. Every real estate blog should be made up of two different kinds of posts: short and long-form content. As a general rule, no post should ever be less than 500-600 words if you want to make it SEO-friendly and provide real take-away value for your readers. While shorter-form posts do serve a purpose, its the long-form content that has been winning over the internet in terms of share-ability and direct sales. While short-form content is not without benefits, long-form content will always provide you the best bang for your buck because you can re-purpose it in so many ways. The majority of blog posts published on the web are 500 words or shorter. You can stand out in search engines by adding at least an extra 1,000 words. Longer articles generate business leads for a longer time frame. This is because they attract back-links and organic traffic from Google forever. Long-form posts position you as an authority in your industry. Your audience appreciates comprehensive posts that delve into the intricacies of their pain points. Long-form content keeps prospects on your site longer because they won’t need to jump on 10 different websites to get the same information. Long-form is sustainable. You can launch a marketing campaign solely by re-purposing your long-form content pieces. There is no way getting around the fact that longer posts means a lot more work. Whatever you do, don't write them just for the sake of writing them. You need to make your content count! That means that you need to select topics that are worthy of delving into on a deeper level and can be broken up into smaller sections. It also means that you will need to take the time to do significant research to find the necessary information to support your claims. Remember, while the purpose of your blog may be to promote or sell your real estate products or services, the content should not be an extra long sales pitch. Instead, make your posts informative so that your readers see you as the expert and authority on the subject. Your primary motive in all of the real estate content that you create should be to provide your readers with substantial value. When you produce substantial and regular content that is in the best interest of your ideal clients, those people will engage with you and begin to trust you as an expert. Altruistic real estate content will also help you to create a community around your business and your unique real estate brand. That way, your target market will feel compelled to hire to you when they need related real estate products and services. Again, your long-form real estate blog posts can't just be stuffed with a bunch of meaningless fluff that is of zero interest to your ideal clients. You should also be careful to avoid indulging your ego in your posts. Remember, it's about them, not you. Statistics, graphs, info-graphs, branded images and quotes that support your points. Citations of your sources so your readers know you're legit. 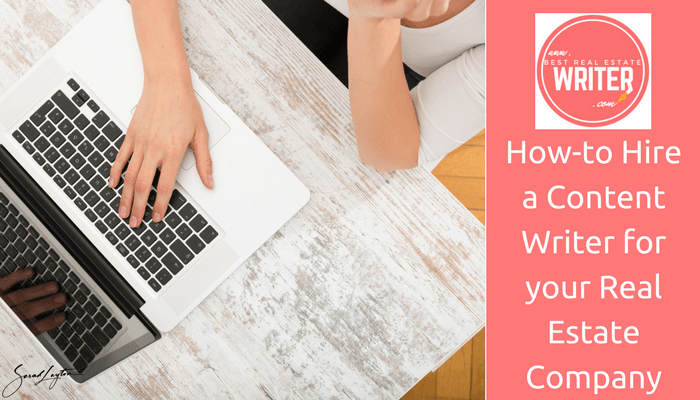 If you have been feeling overwhelmed by the amount of time it's taking you to write your daily minimum 500-word blog posts, then the idea of having to write 1,500-3,000 words a day, is likely a disheartening one. The truth is you don't have to. You really only need to be producing two or three SEO-friendly long-form content posts per week. 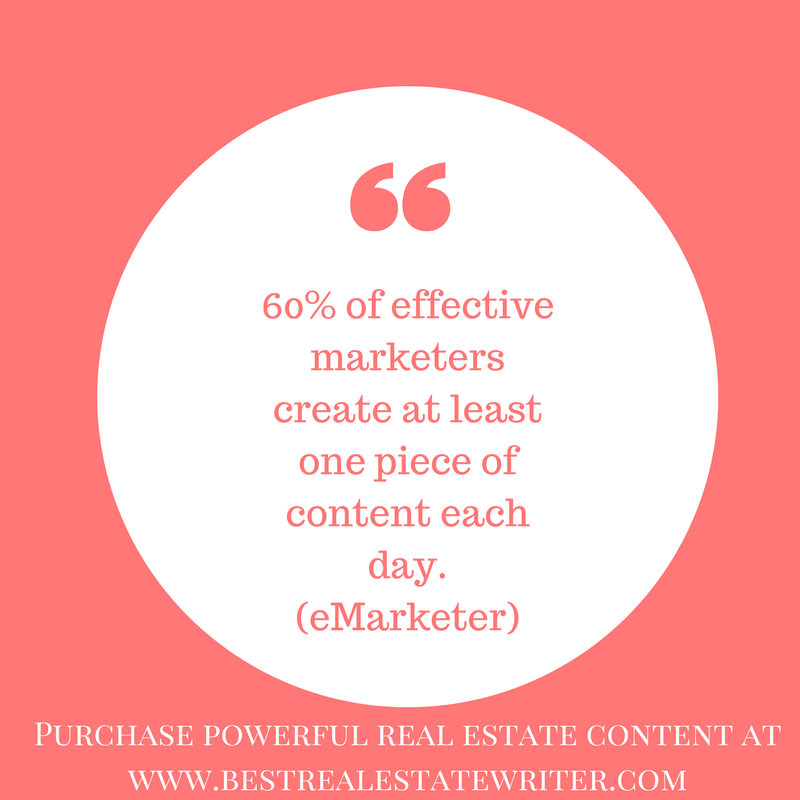 However, the more valuable real estate content you publish, the faster your business will grow. 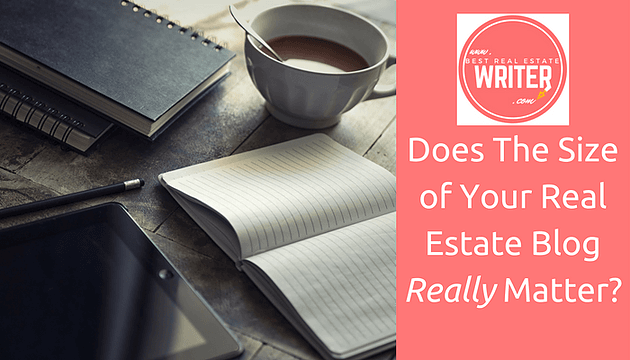 How Many Articles Does Your Real Estate Blog Need? The number of articles or posts that you have on your real estate blog matters just as much as what is in them. One of the largest benefits to having a real estate blog is that it lends itself to creating vast credibility to your image as a real estate expert. 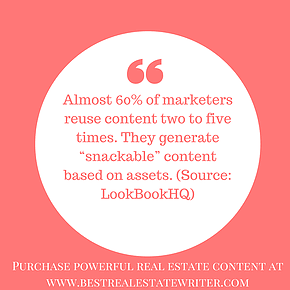 That is exactly why it is SO important for new or young agents to create more content than most. However, if you only have a few articles or posts on your real estate blog, it could actually hurt your image and credibility. Imagine logging on to a website or blog where someone is trying to sell you on the idea that they are THE EXPERT on a topic in order to sell their professional services. When you look at their blog however, they only have four or five generic posts which barely scratch the surface of the topic and are filled with fluff. Are you going to be convinced that they know what they are talking about and are worth hiring? Of course not! 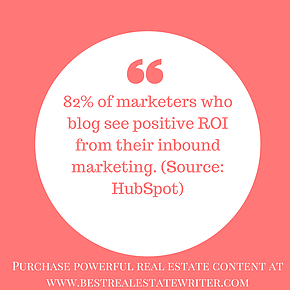 The same applies to the content that you post on your real estate blog and website. It needs to be valuable, in-depth, and supported by many other posts that showcase your knowledge and the fact that you are the expert prospects should hire. Don't Want To Write Daily or Weekly Blog Posts to Grow Your Real Estate Business? If the idea of having to research and write several 500 word posts and a few 3,000 or greater word posts each week to grow your business doesn't sound like fun, don't worry! I know that's probably not why you got into the real estate industry. If we have learned anything in the modern era about time management in business, its that your time should be focused doing what you do best and delegating the rest out to others. One of the best investments you can make with your marketing dollars is to hire a real estate content writer and marketer to produce your real estate blog for you. The best professional content writers understand how to properly research, write, and format both long and short-form content the right way to grow your web traffic, get you more leads, and close more business. It is also wise to work with a content writer that specializes in real estate. For example, I write about all things real estate because I have a wealth of real estate knowledge from my many years of experience in the industry which allows me to translate complex real estate topics into easy-to-digest content for readers. So, now that you know that the size of your real estate blog really DOES matter, you need to create an actionable content strategy to make sure yours is on point. Thank you SO much from the bottom of my heart for taking time out of your day to read this post about the length of your real estate blog! If you enjoyed reading it or learned something, I would be honored if you would share it with your social network by posting it on your social media or emailing it to someone that might also enjoy it!